Compañía de Vinos del Atlántico produces this Rabelo , a red wine from Douro produced with tinta roriz, touriga nacional and touriga francesa grapes. 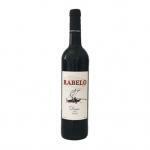 The Rabelo is the ideal red to combine with lamb and red meat. Uvinum users rate this red wine with 4,3 out of 5 points. What's the evaluation of the Rabelo?